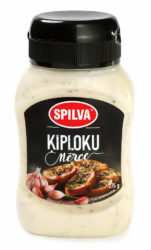 Garlic sauce with a distinct taste of garlic and mild consistency, as there are garlic peaces inside. It is great with meat and potato dishes. For differentiating every day meal, it can be also used, together with salads, instead of mayonnaise. Best before is 9 months. 100g product contains: 1.8g protein, 10,0g carbohydrates, 18.0 fat.